These days, I feel disconnected. Disconnected from my mom, whom I have sent to Iran with two suitcases and a carryon full of art, books and tech materials for the latest Building Bridges Rooftop Reflection Tehran Series. Disconnected from an art world that seems to continue on, even though my world has been stuck spiraling in a quagmire of repetitive rituals. The world and all the people in it continue as I replay the footage from Tehran’s post 2009 election protests over and over in my mind. My computer screen lights up the hallway of storage units, where I am experimenting with the creation of an experiential art-form, using crates and audio visuals from that day at the cemetery. It is showing footage I took at a protest my mother and I attended on July 30th, 2009. The protest was held on top of open graves at Behesht-e Zahra, during Neda Agha-Soltan’s 40th day from death, funeral procession. Neda’s mom was not granted permission to attend her daughter’s funeral. In 2009, after the arrests and the funerals, one of which was for my first childhood friend Mostafa, the only thing that seemed important was opening Masami Teraoka’s Solo at the MOCA in Tehran. Everything I had to say about the taboo topics of globalization, westernization, sanctions, fundamentalism, HIV, prostitution, young girls trafficked as Iran’s highest export, could be found in Masami’s controversially bold watercolor paintings.1 The paintings were done in the 1970’s with traditional Japanese brush marks, but they were perfect for a “Jumong” obsessed Tehran of 2009.2 The 2009 uprising was more influenced by “Jumong” an extremely popular South Korean soap opera among Iranian youth, than by Mir Hossein Mousavi. Masami’s watercolor paintings embraced and visualized the esthetics of the green movement, in ways that the Islamic Republic could never wrap their heads around. After the reality of the arrests and Mostafa’s funeral set-in, I took our Building Bridges message from the streets of Tehran onto the rooftops. In a series of super secretive rooftop reflections, I started disseminating info, art and news across the rooftops of Iran and India. The last one took place throughout the month of January. The next one was to start on April 10th and go on through the summer of 2011. Last night, while isolated in my artist corner, I thought to cut back on the rooftop screenings (due to funding), but the light of day reminded me of why I started the rooftop reflections in the first place, during those tumultuous days of 2009. We have enough little projectors and I’ll try to get more of the little $150 netbooks with Skype and wireless capabilities. I think it’s important for people in the diaspora to see, hear and feel the sense of isolation the young people stuck in Iran feel. Most Iranians in Iran wish, and think, things would be much better if they were standing on the streets of Los Angeles; where most Iranians in LA would give up everything for an opportunity to visit the blood soaked streets of their homeland. On July 30th, 2009, my mother and I got out of an air conditioned cab and stepped into a dust filled, field of countless open graves. The heat emanating from the summer khak, sizzled through thin wearing soles of my Kafsh-e-Meli shoes. Fear quickly took over any musings I may have had of adventure and excitement of attending a green protest – with no green in site, among the open graves of Behesht-e Zahra on that hot July day. I sat down near a group of mourners and watched my mother revert to who she was before the régime change of ‘79, the Iran-Iraq war from 1980-1988, and my birth in 1984. She pumped her fists into the air, flayed her body and will towards those detaining the young people in protest, and rallied at a group of young boys taking prisoners back, before they could shove and drag their prey into waiting vans. My mom was legit, had street cred. Sure of her every step, she seemed to know things, like she had been there before. Here I am again sitting in a place where people store all the things they don’t have room for in their lives, collecting scraps of material, dirt and making art, while my mother, aunt and grandmother are on the front lines of change in Tehran. I feel disconnected from the world (and the women of my family/Iran). While I’m instinctively dedicated to a creative process I haven’t yet fully understood, I remember this is not the time to slow down or limit the creative exploration of change and revolution. The cover photograph is a reminder that the struggle continues even after those of us who can, fly back to safety. 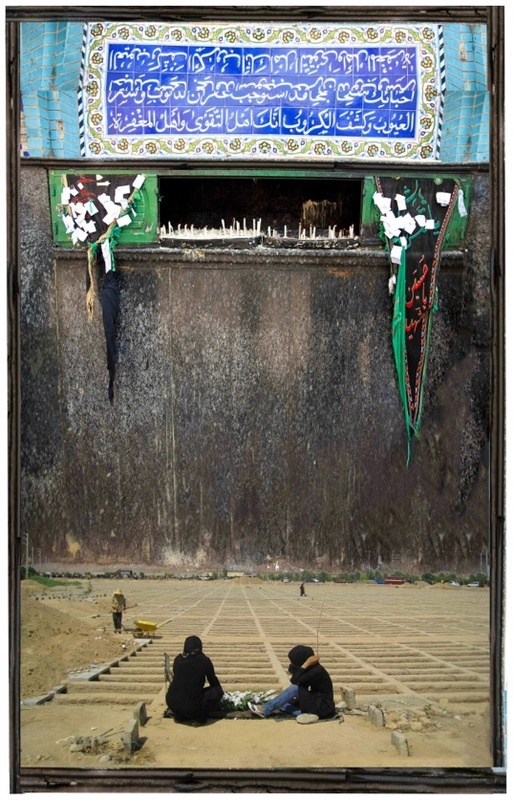 The image is a montage of two pictures I took: one on that day at Neda Agha Soltans grave in Behesht-e-Zahra, during protests held on top of open (pre-dug) graves; and the other during my post-arrest travels throughout Azerbaijan (Ardebil, Iran, 2009).